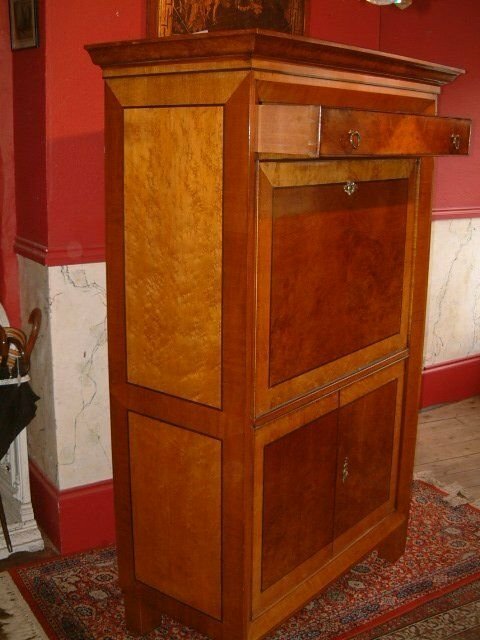 Biedermeir Escritoire Karelian Birch 19thc with Birds Eye Maple Panels the Fall Front with Leathered Writing Slope with Mulberry Panels, revealing a Fitted Architectural Interior with Numerous Drawers & Sliding Mirrored Centre Section with White Painted Doric Columns and Parquetry Floor Revealing Secret Drawers to Rear. 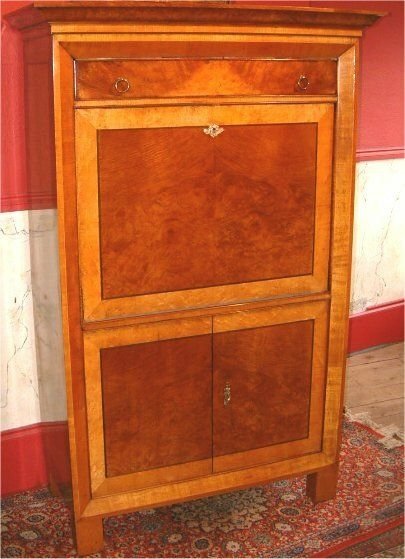 Below are Two Mulberry Panelled Cupboard Doors. 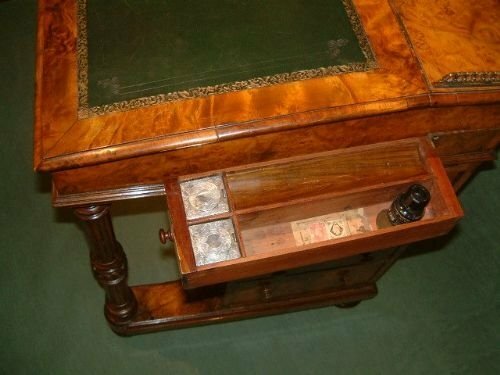 With Double Turn Locks & Keys. 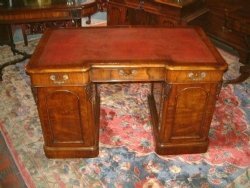 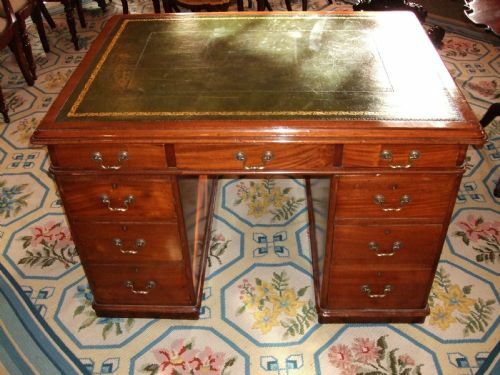 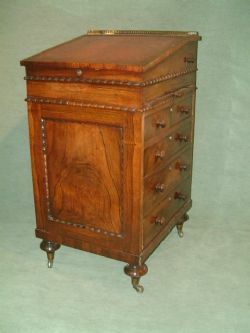 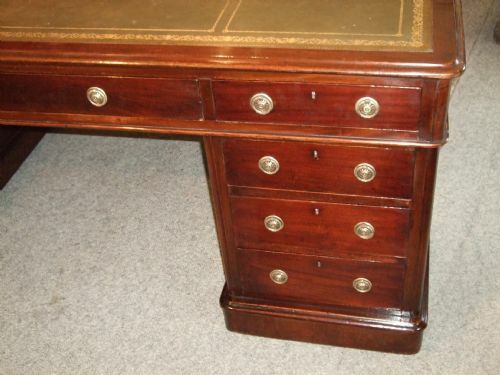 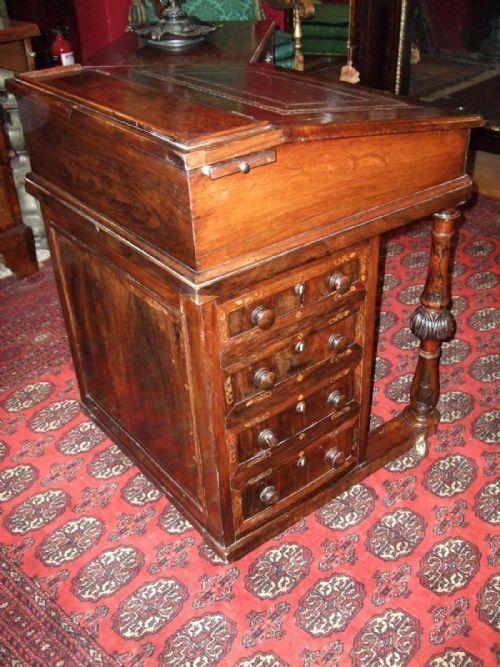 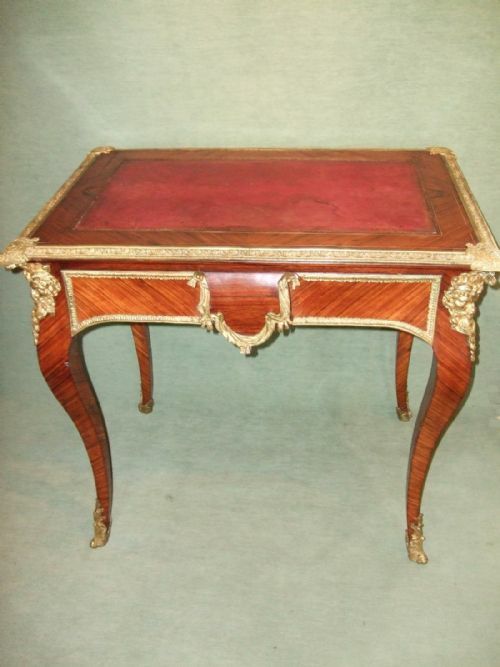 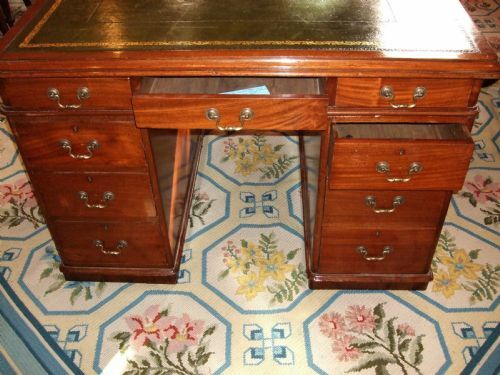 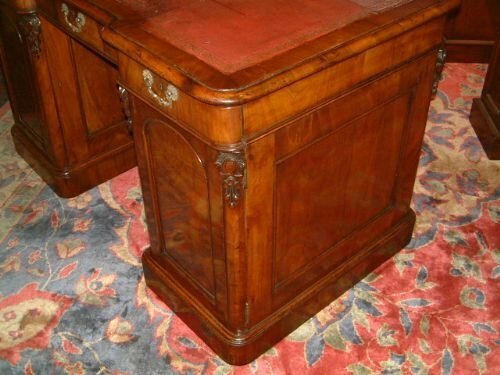 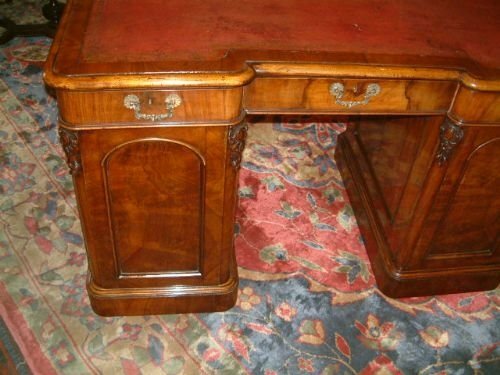 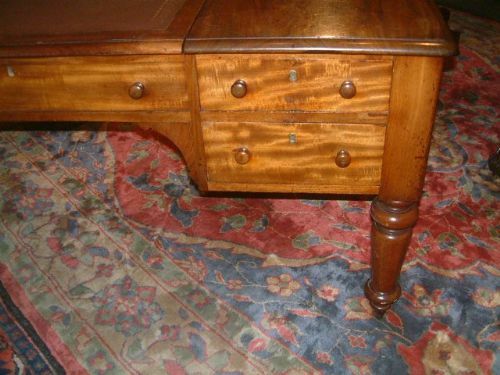 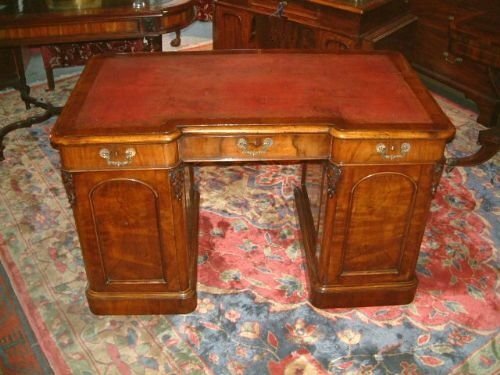 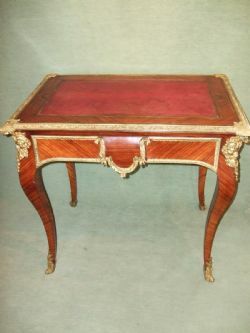 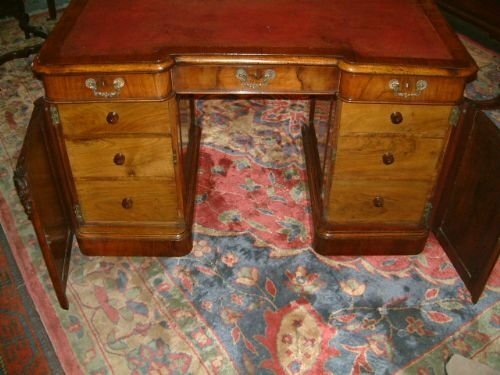 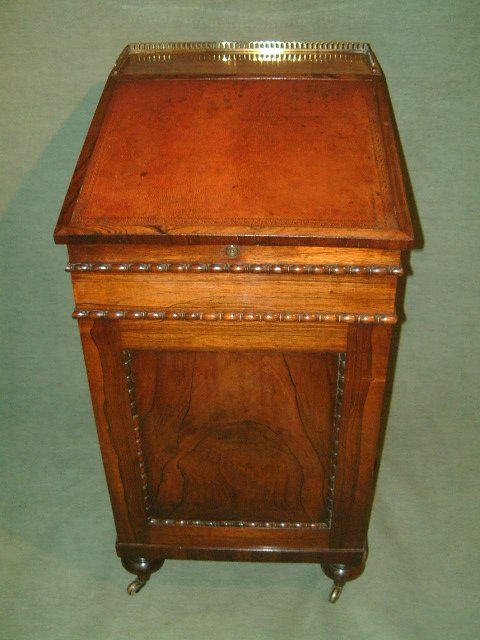 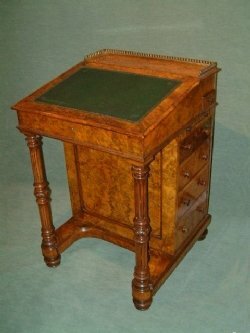 Early 19thc Mahogany Pedestal Partners Desk. One Side with 9 Drawers the other with 3 Drawers & 2 Cupboards. 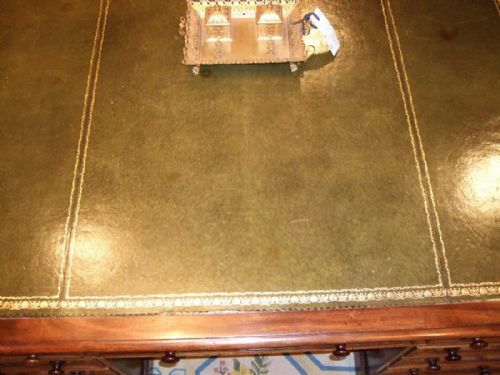 The Writing Surface with Gold Tooled Green Leather. 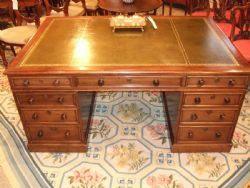 Good Colour & Patination also with a Key to Lock the Drawers & Cupboards. 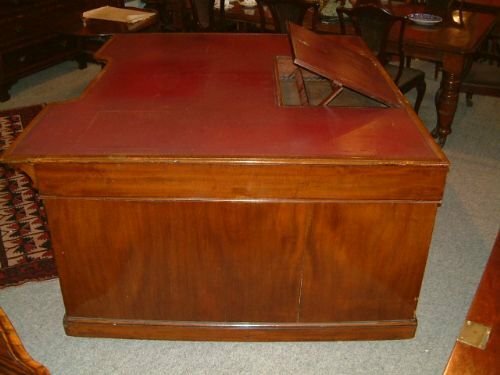 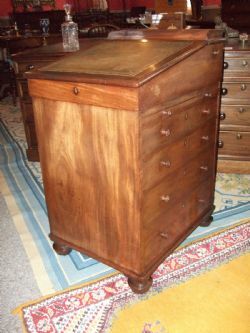 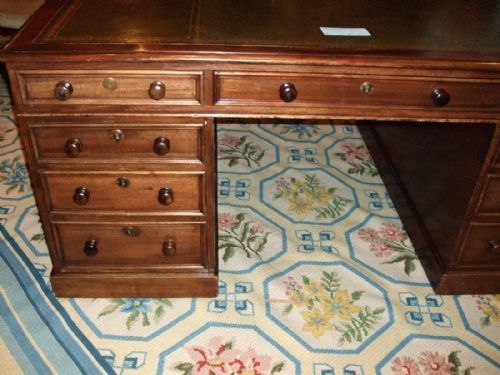 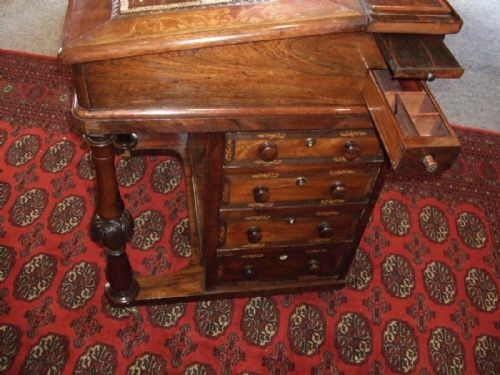 Superb George 3rd Period Mahogany Davenport Desk Excellent Colour & Patination The Sliding Top with Leather & Tooled Writing Slope Revealing 3 Small Drawers & with Slides to each Side & Pen Drawer. 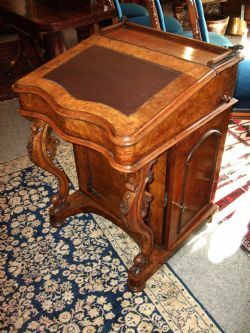 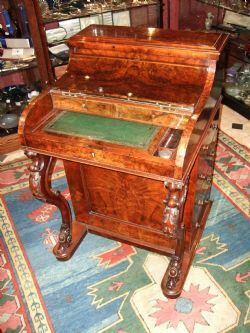 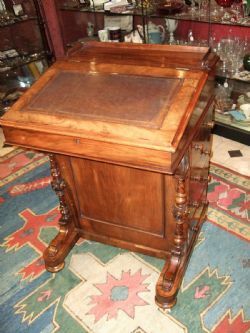 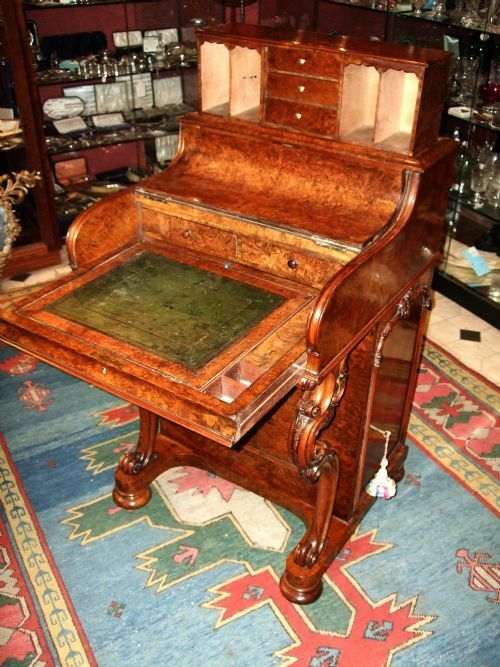 Victorian Burr Walnut Davenport Writing Desk. 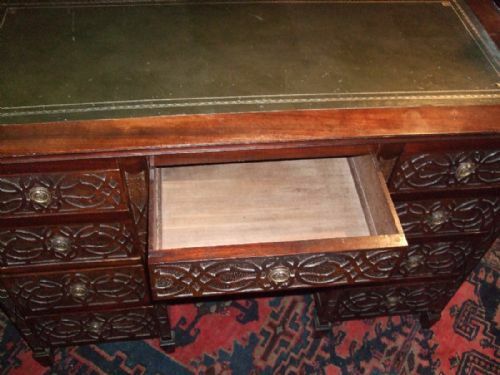 With Cupboard Enclosing Very Unusual Fretwork Drawers to the Right Hand Side also a Pen Drawer Above. 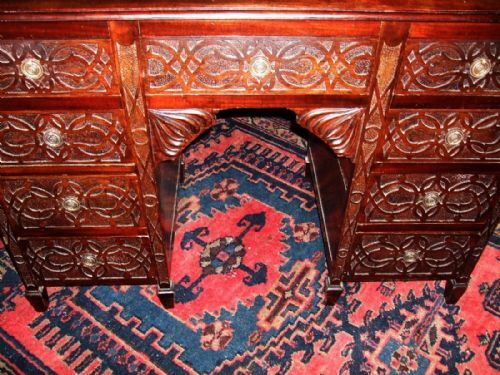 Notable Carved Accents to the Top Shelf Gallery. 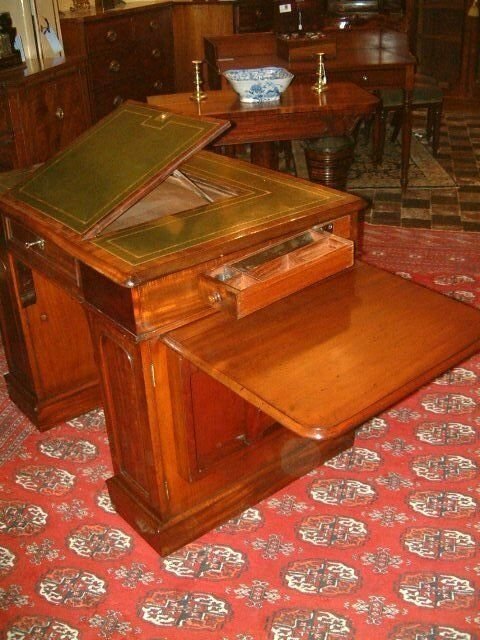 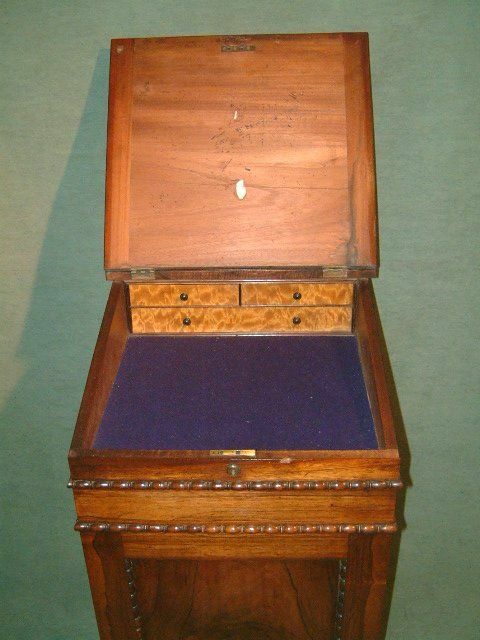 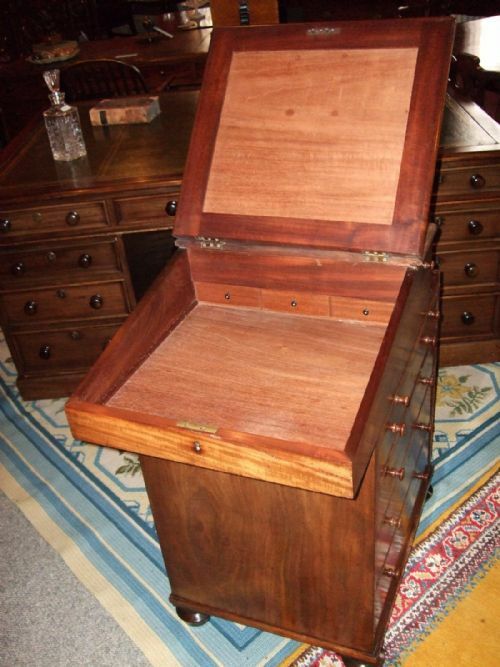 The Leathered Writing Slope Enclosing a Light Birch Interior with Two Small & Two Dummy Drawers. 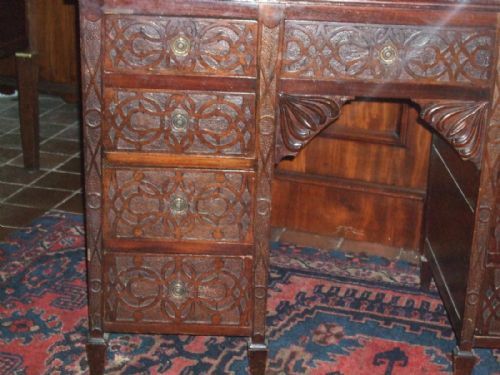 The Front with Twin Carved Scroll Supports. 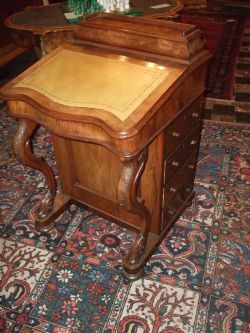 Edwardian Mahogany Writing Table with Cupboard Doors Revealing Drawers, with Carved decoration and Cabriol Legs with Hoof Feet. 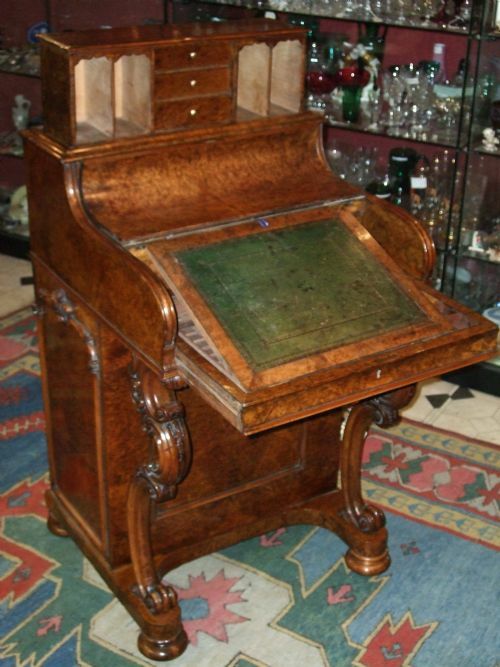 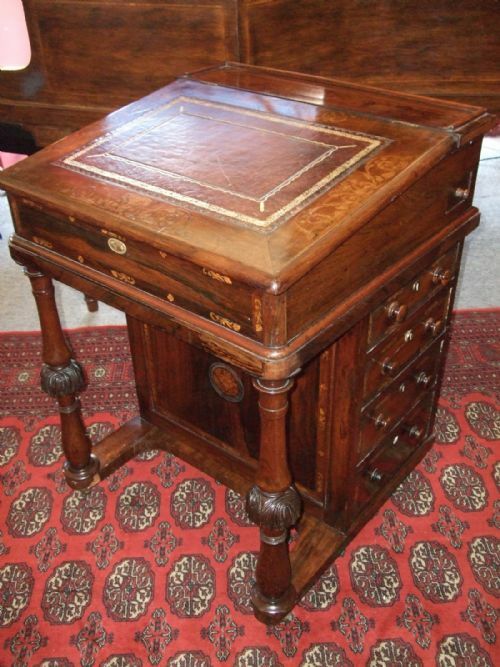 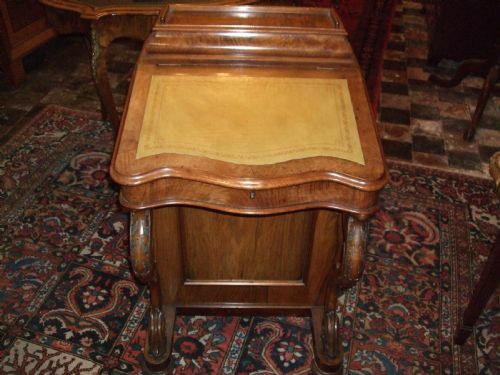 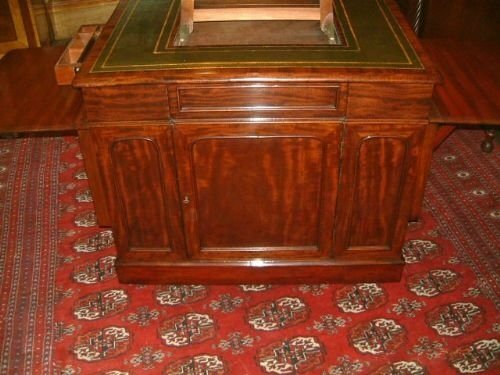 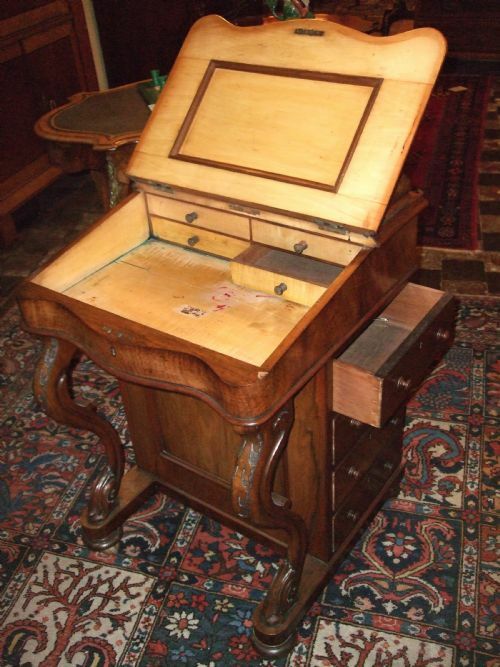 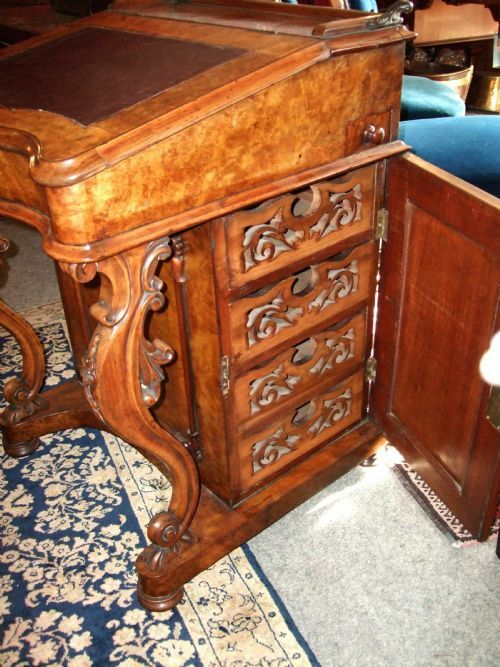 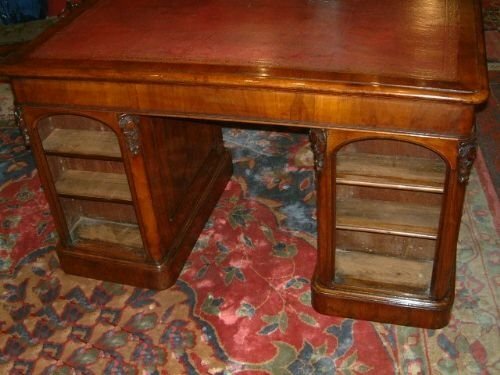 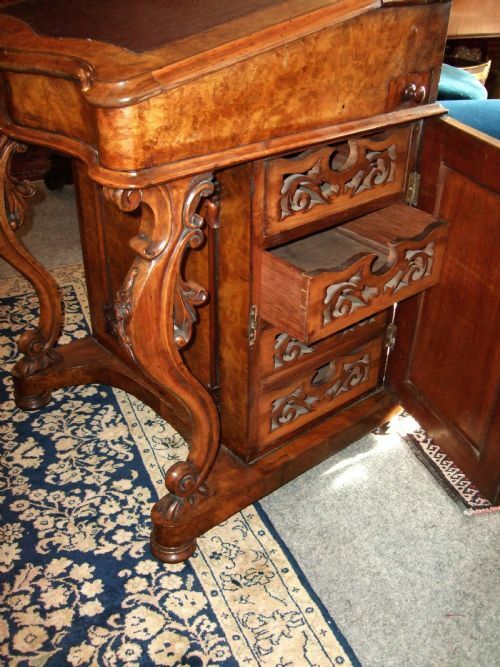 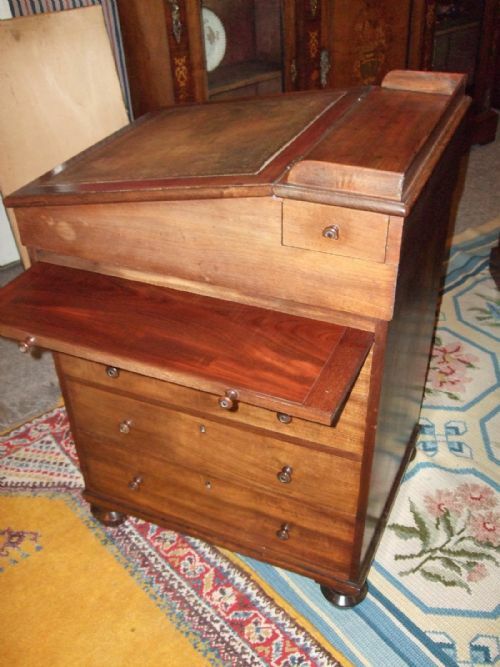 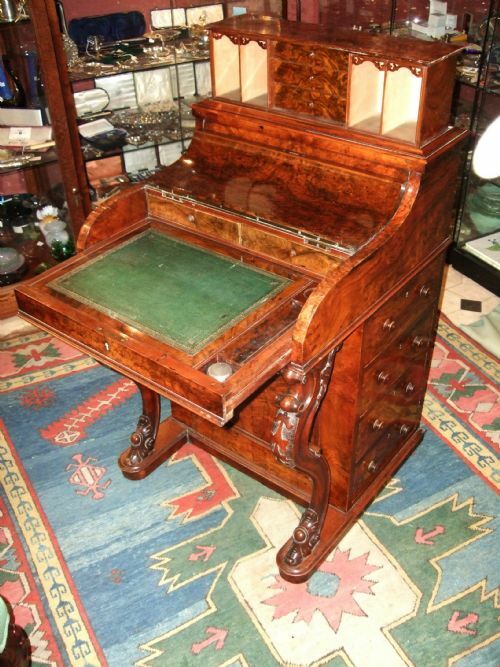 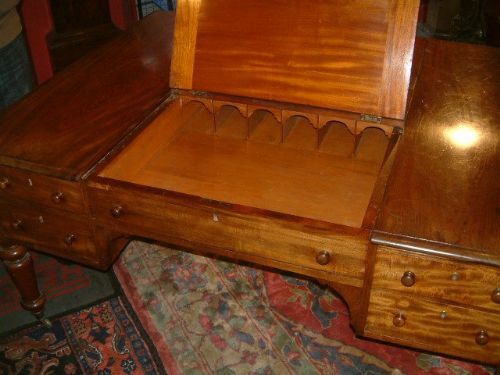 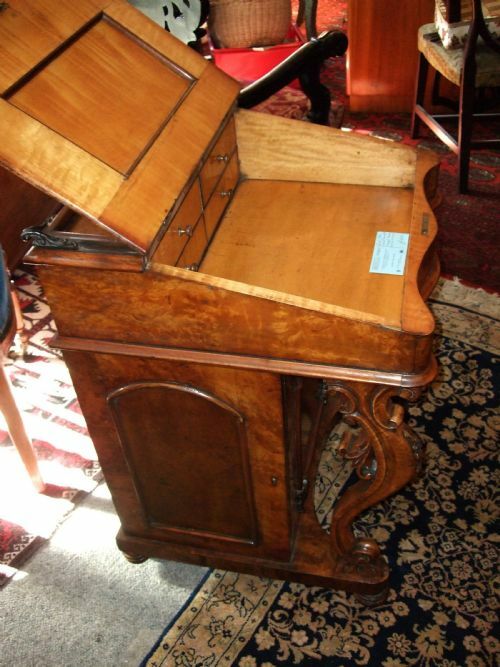 Victorian Walnut Davenport Desk with Fitted Interior & Pen/Stationary Compartment. 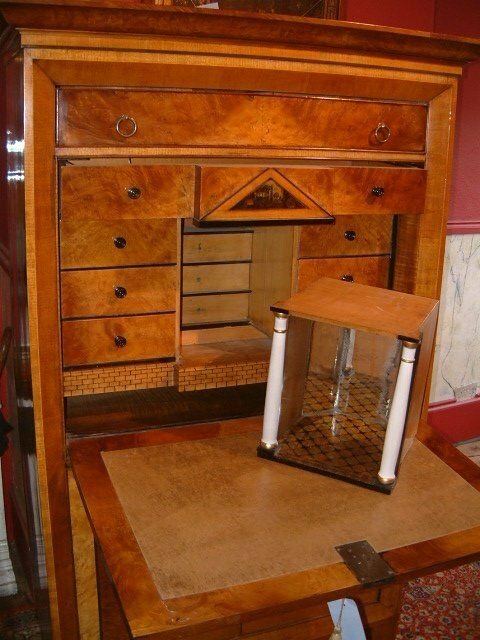 Good Choice of Burr & Straight Grained Walnut Veneers & Birds Eye Maple to Interior. Beautiful Restored Condition Excellent Figuring to the Walnut. 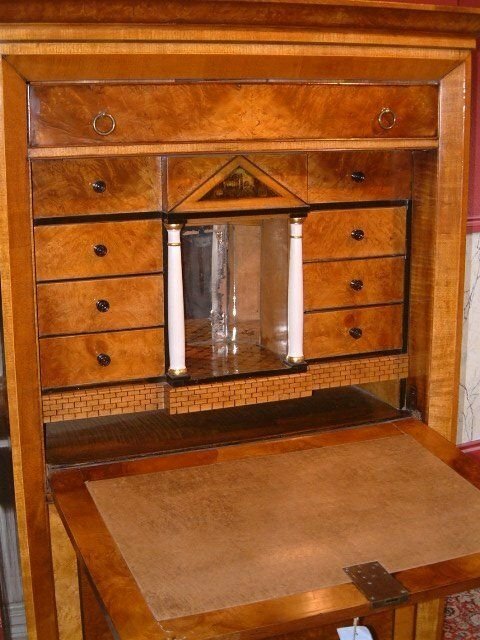 Victorian Rosewood Inlaid Davenport Desk with Pen Drawer and Candle Slides. 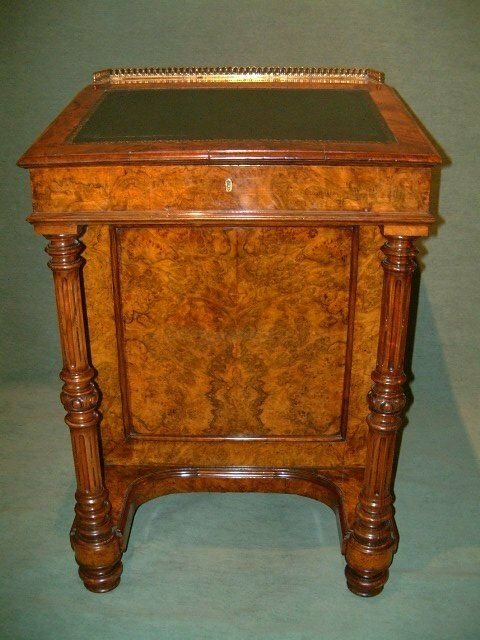 Birds Eye Maple Fitted interior. 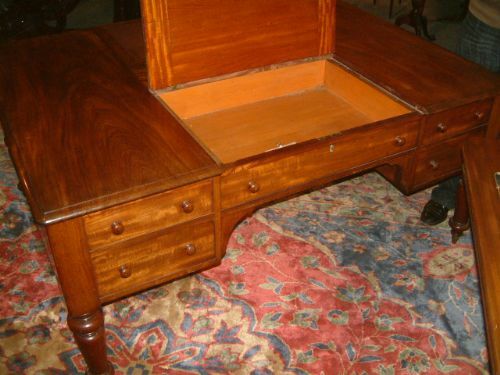 William 1Vth Mahogany Writing Desk Very Unusual Configeration of Small Size the Green Leather Writing Surface with Raising Book Rest to Centre Inkwell Pen Drawer to the Side, Drop Flaps to the Sides, Centre Drawer Surmounted by 2 Concealed Drawers above a Kneewell with Brass Catches to the Pedestal Panelled Cupboard Doors with Cupboard to the Rear. 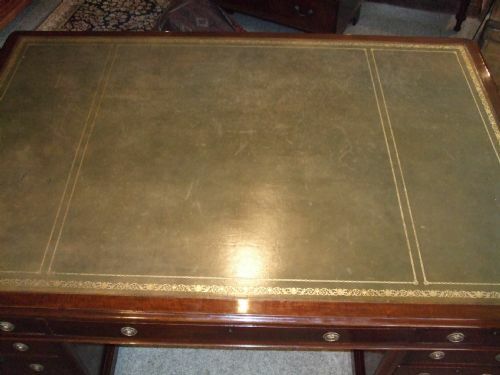 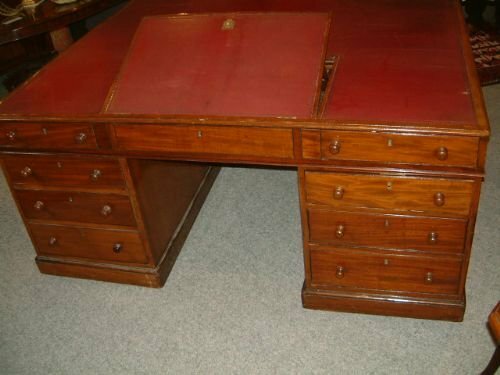 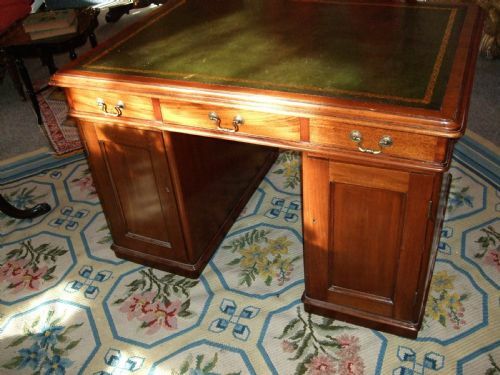 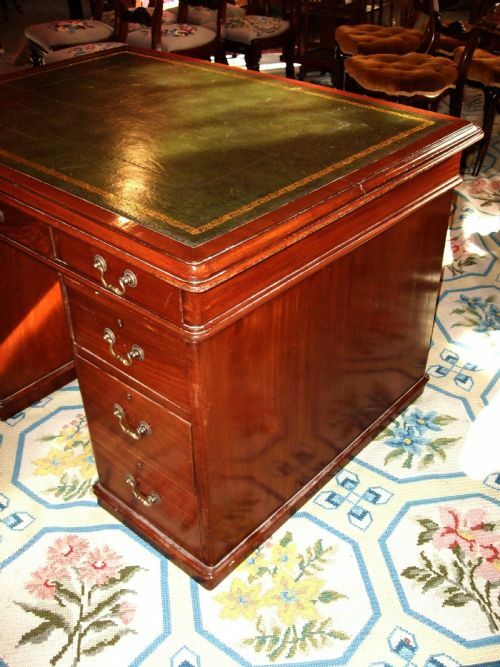 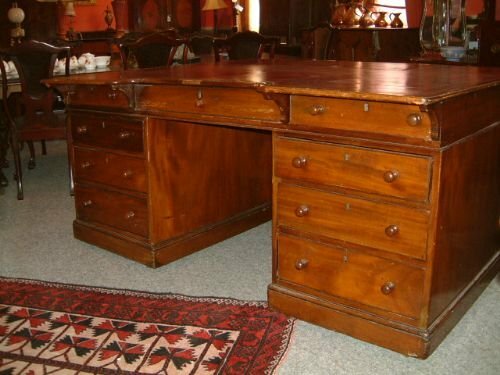 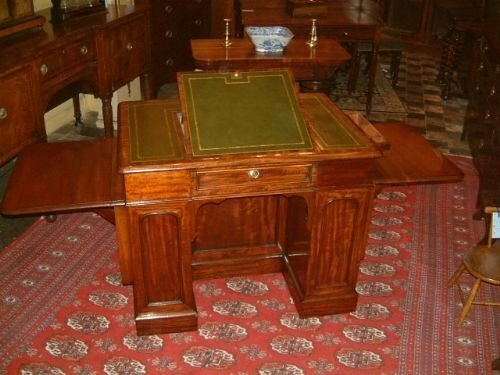 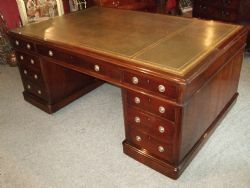 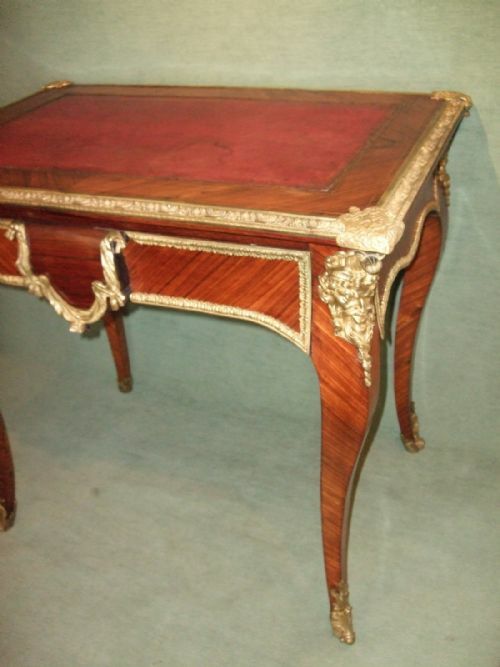 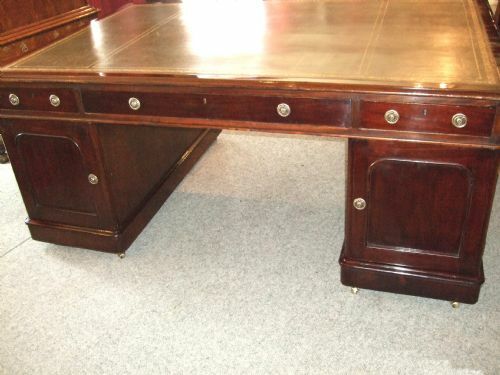 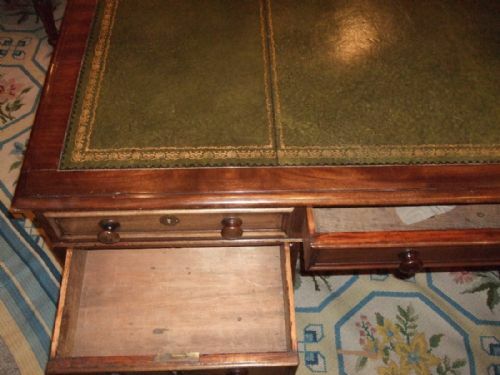 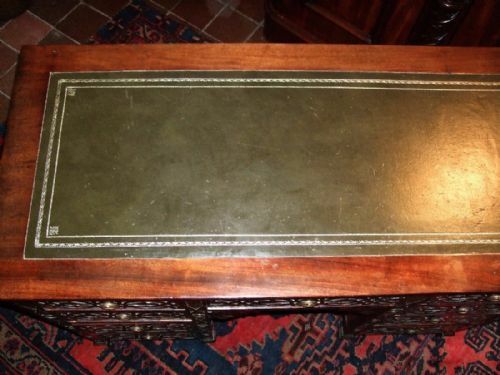 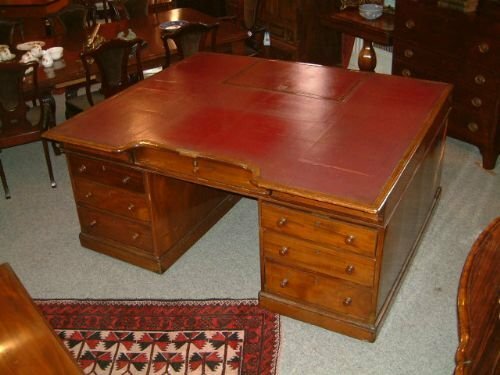 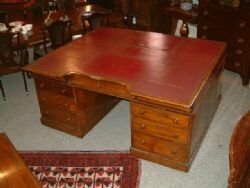 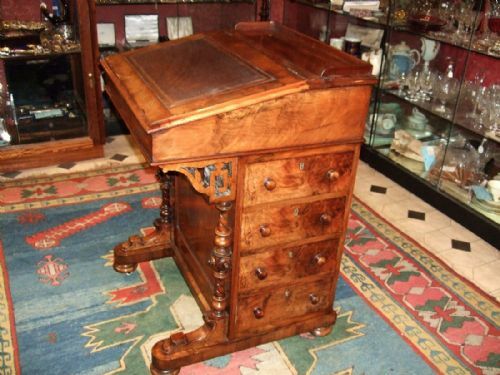 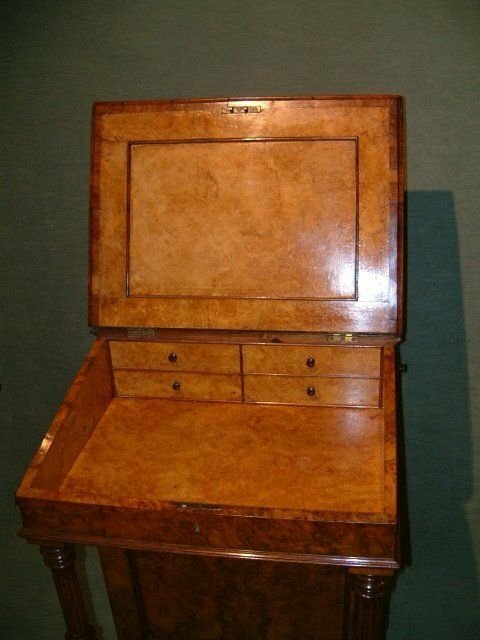 Superb Victorian Large Partners Desk Provenance Somerset House London. 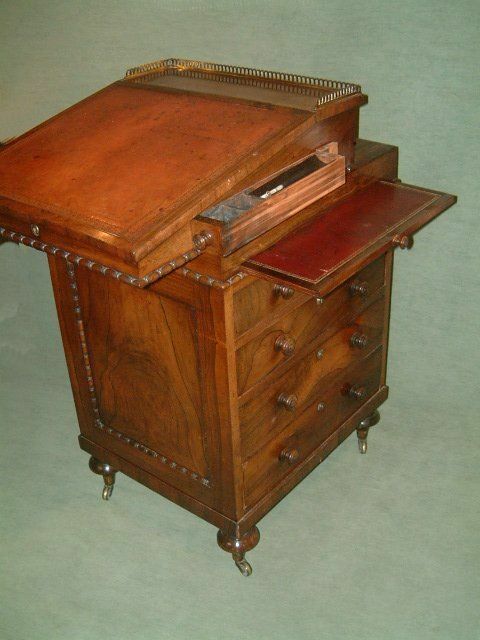 The Red Tooled Leather Top with Racked Writing Slope. 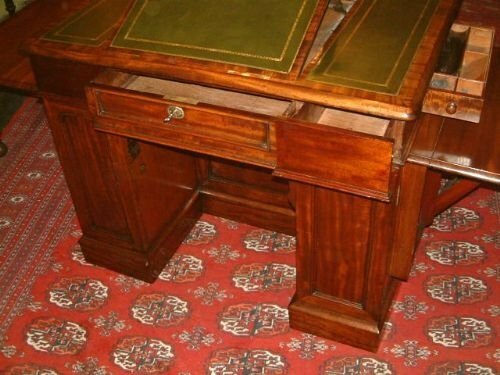 Of Partners Configuration with Two Leathered Writing Surfaces Revealing one with Pigeon Holes, & Dummy Drawer Fronts to the Rear.Well Figured Mahogany Good Colour & Patination. 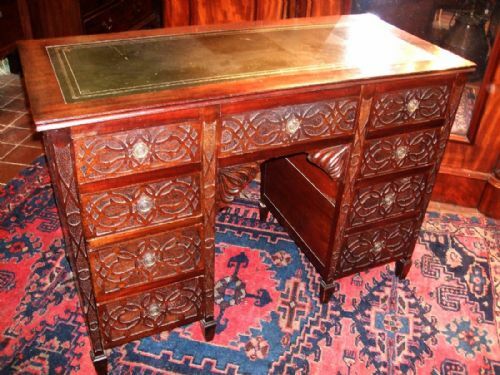 Stunning 19th Century Walnut Writing Desk with well Carved Accents, the Drawers are Beautifully Concealed by the Arched Panelled Doors, to the Rear are Unusualy Open Shelving All Original Brasses & Knobs. 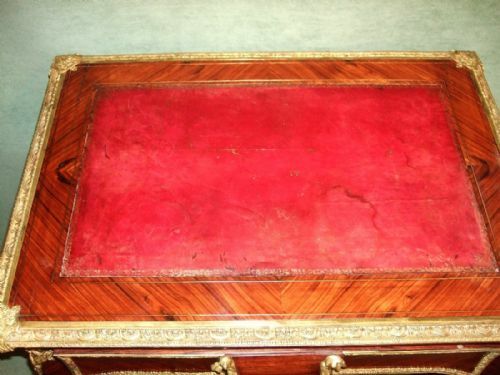 The Red Leather is Gold Tooled. 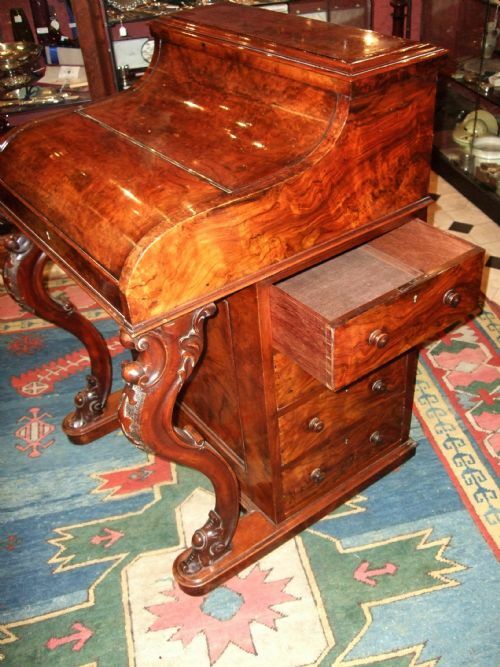 Victorian Burr Walnut Piano Top Davenport desk. 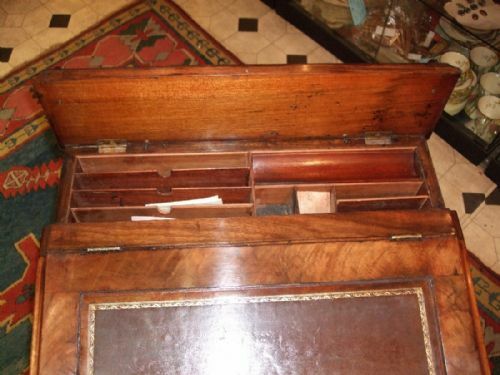 Superb Example Secret Catch to Operate Sprung Loaded Pop Up Compartment.With Inkwell. 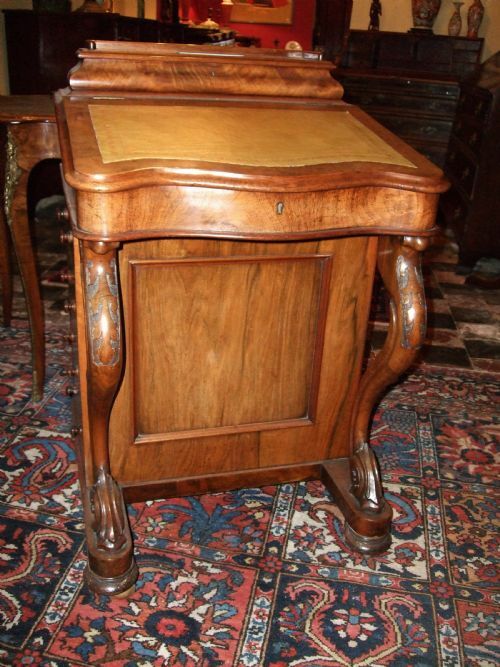 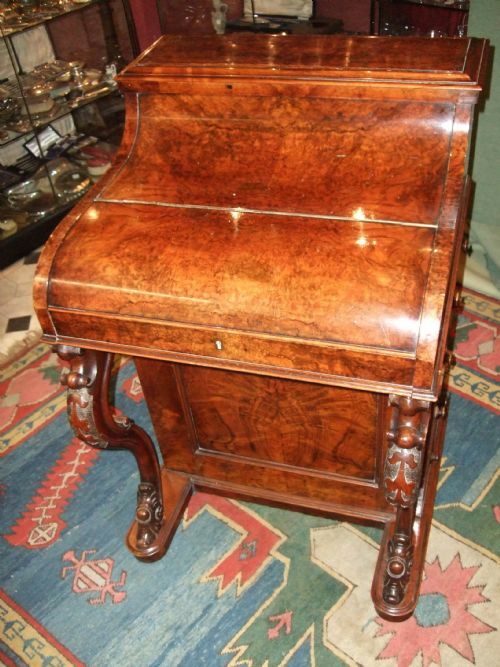 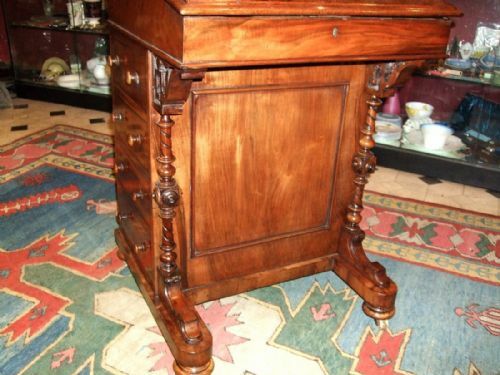 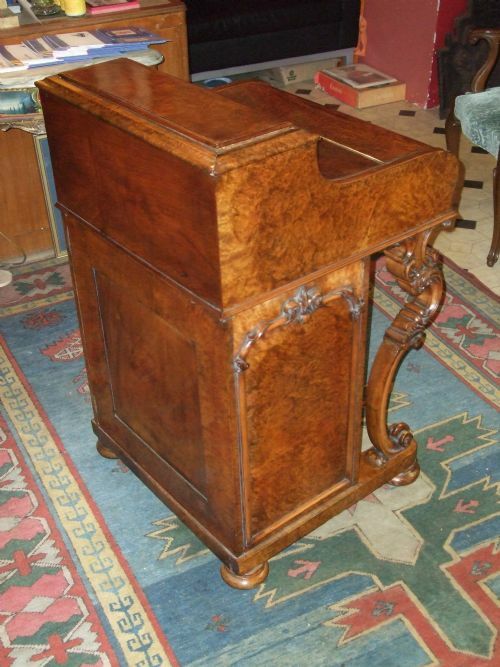 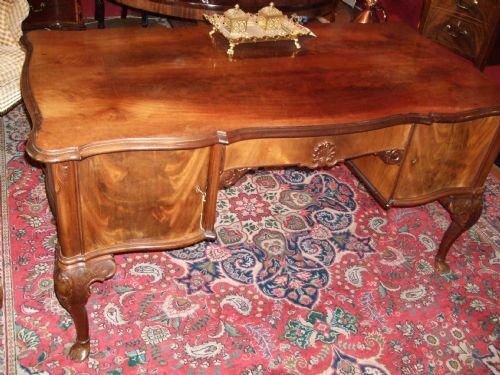 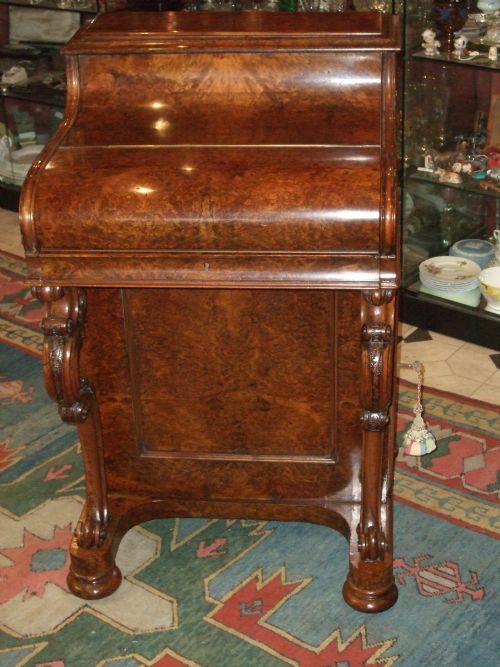 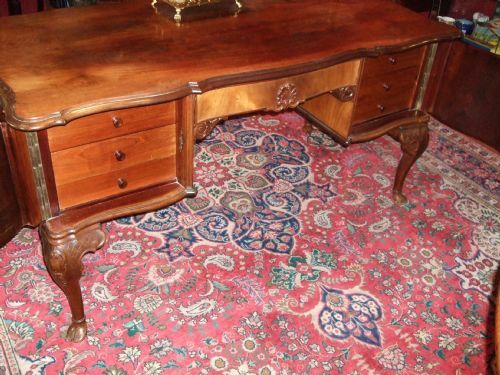 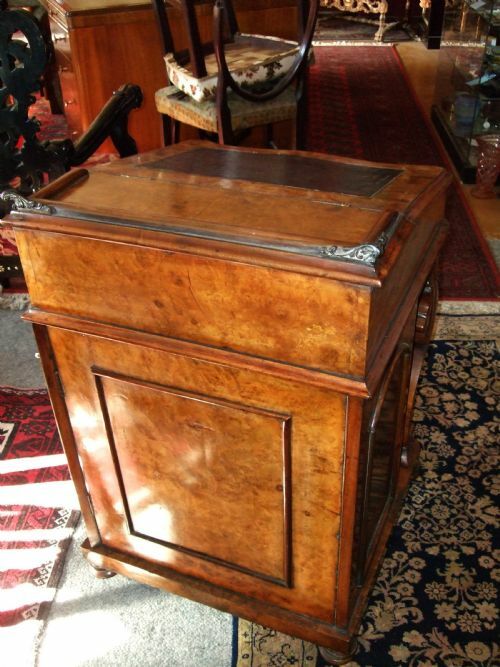 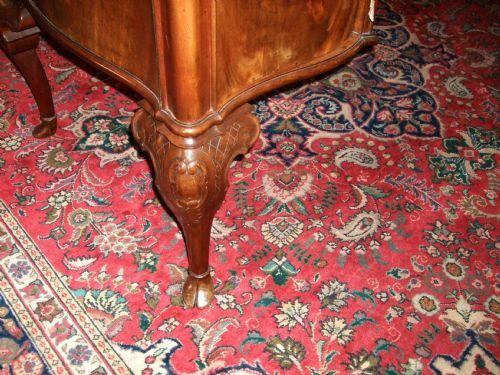 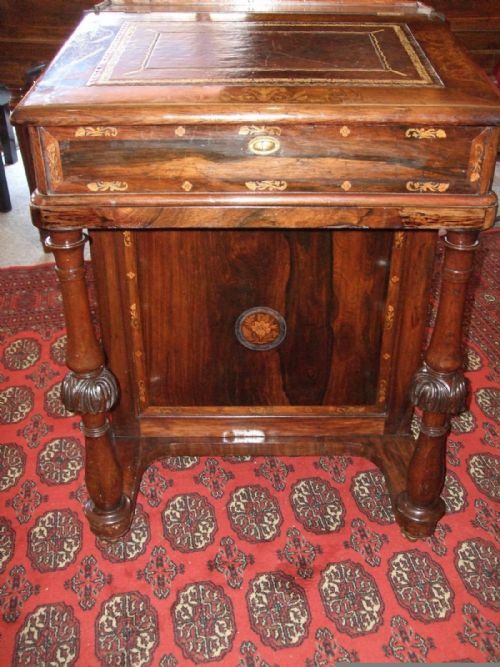 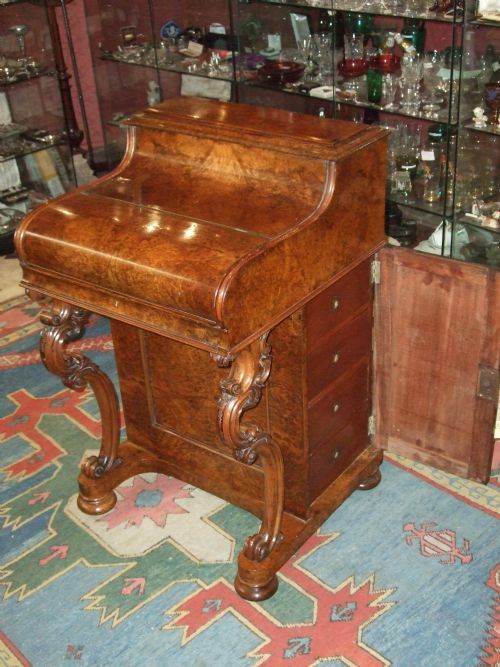 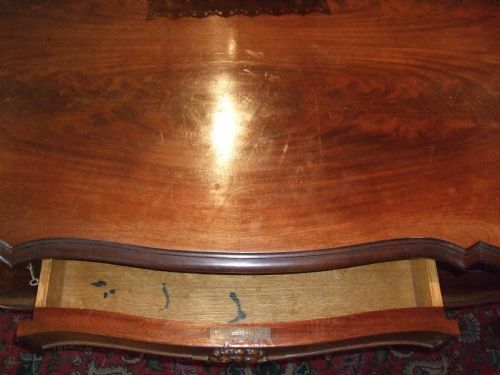 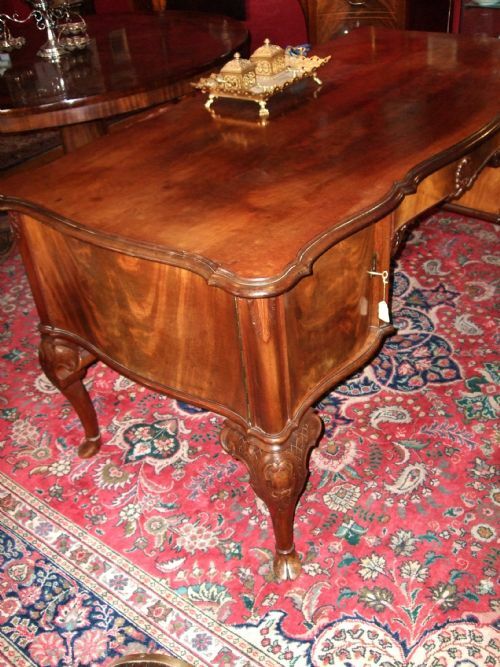 Fabulous Victorian Burr Walnut Piano Top Davenport Desk. 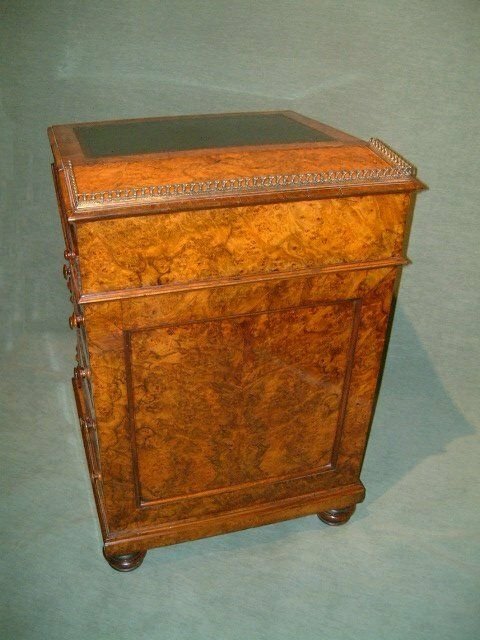 Superb Burr Walnut Matched Veneers, Secret Catch to Release (Pop-Up) Piano Top with drawers & Pigeon Holes, Writing Slope Pulls Forward & Elevates with Compartments for Inkwells & Pens, Side Cupboard door to Reveal Four Drawers. 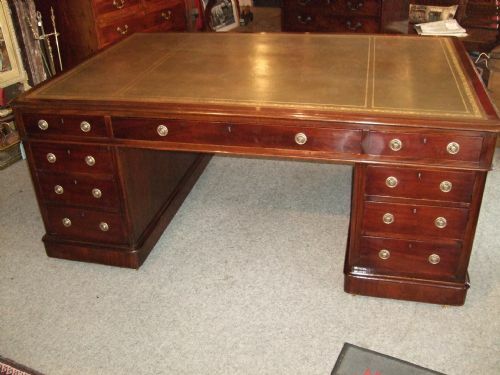 Fabulous imposing Desk with Drawers to the Front & Cupboards to the Rear. 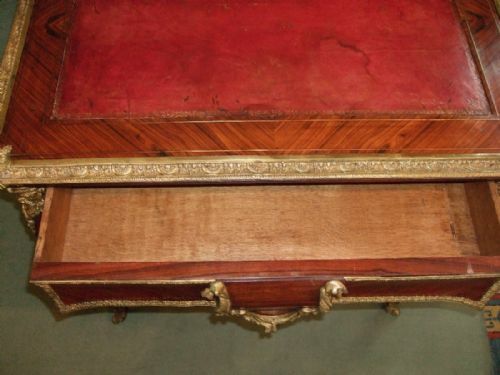 19thC French Kingwood & Ormolu Mounted Bureau Plat with Secret Drawer Opening Catch. 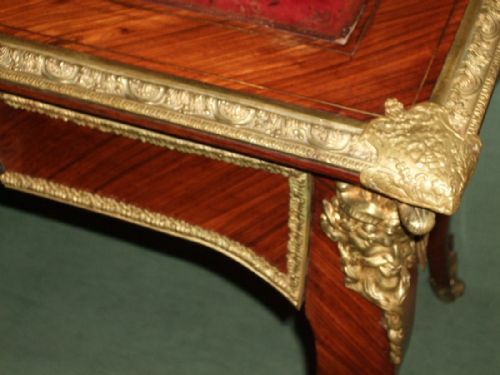 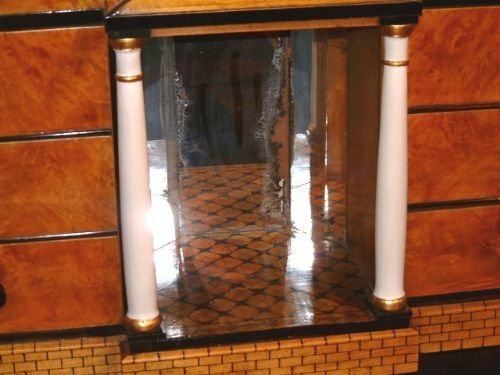 Superb Ormolu Mounts Original Leather Top with Gold Tooling , The rear of the Table is the same as the Front so is free standing. 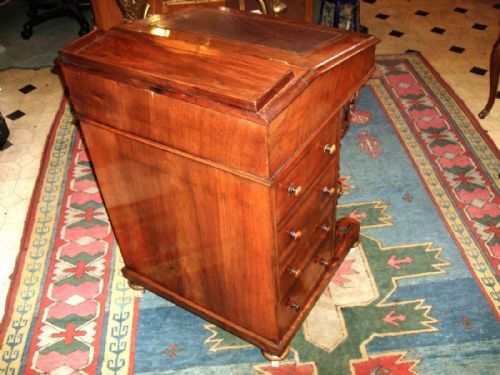 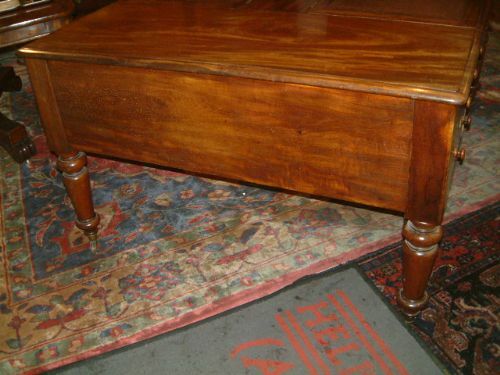 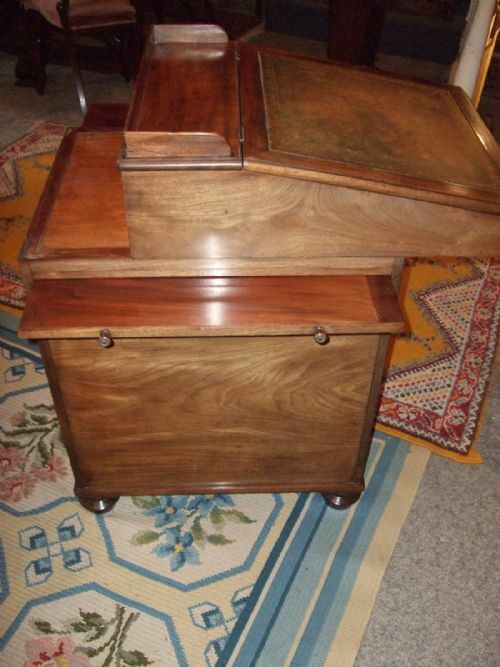 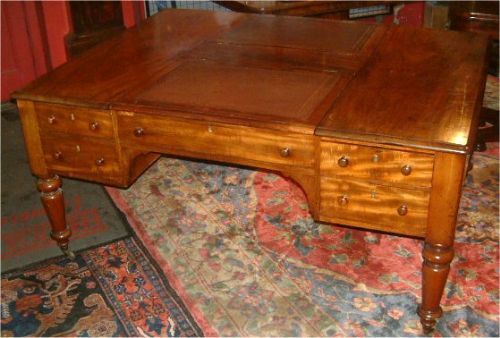 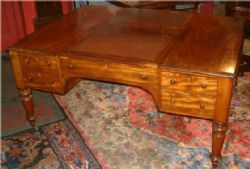 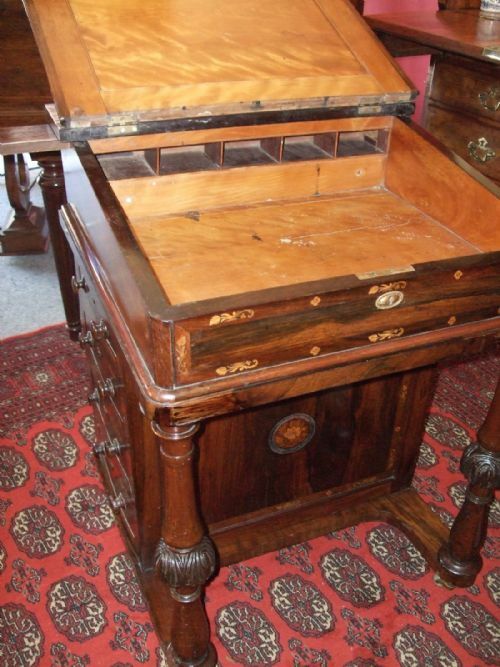 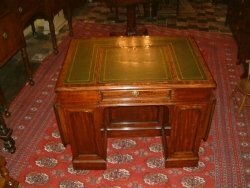 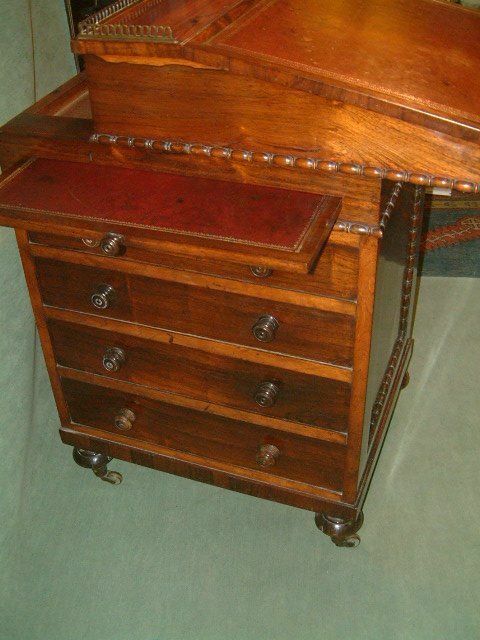 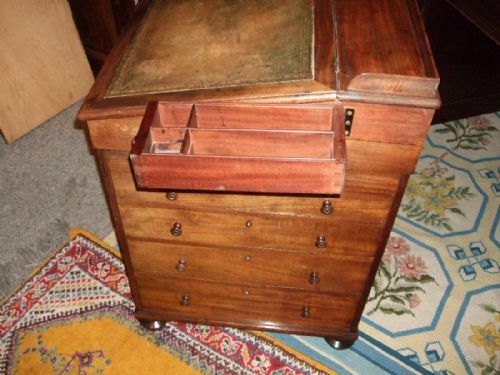 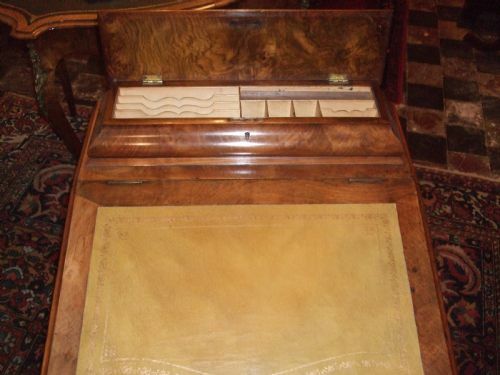 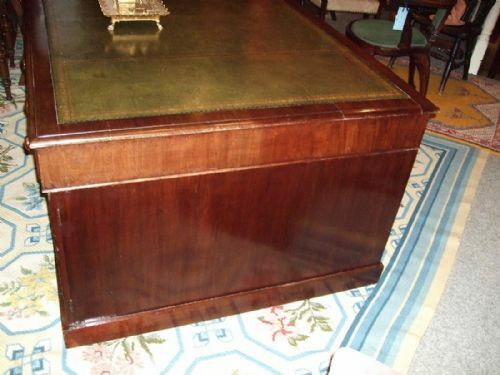 Regency Period Rosewood Sliding Top Davenport with Brass Gallery Fold Out Pen Tray Book Slides Etc on Brass Casters.